We are getting into the Winter time here in Lake Arrowhead, but there are still things going on in our beautiful area. Remember this weekend is the time change! Check out what’s going on. Church of the Woods will be having their Harvest Festival on October 31, from 5PM-8PM, free BBQ from 5-6:30 and then Trunk and Treat and games following. 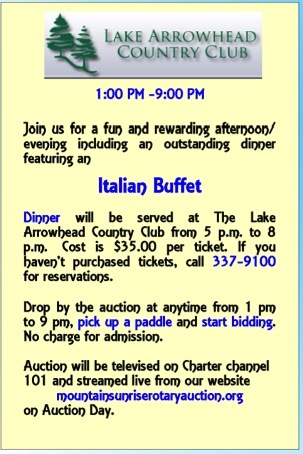 Mountain Sunrise Rotary Annual Auction Dinner at the Lake Arrowhead Country Club ~ Saturday November 2nd.